Former Wales rugby union defence coach Clive Griffiths is recovering from a suspected heart attack. 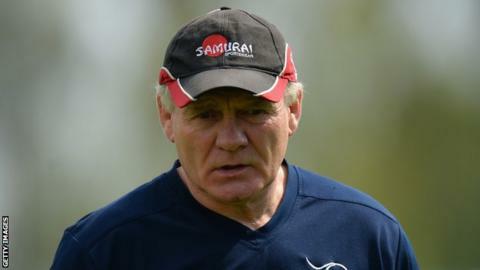 Doncaster Knights, who Griffiths coaches in the English Championship, said the 64-year-old is in hospital having tests and is expected to make a full recovery. Knights say he became ill while jogging on Friday evening. Ex-Wales rugby league coach Griffiths became Wales defence coach under Graham Henry. The former Llanelli full-back continued as an assistant under Henry's successors, Steve Hansen and Mike Ruddock. Doncaster said: "We are sure that everyone concerned with Doncaster Knights and the wider club will want to join us in sending our very best wishes to Clive." Griffiths' coaching career has also included stints at league teams Warrington Wolves, South Wales Dragons and North Wales Crusaders, as well as union sides Newport, London Welsh and Worcester.